Sleeps 2. Treetop Cottage is a modernized chalet-style stone cottage in an idyllic setting. This unique one story dwelling, with a spacious sunny veranda perched above a delightful wooded valley has magnificent views from its large picture windows. It is the ideal retreat for anyone seeking tranquility amid unspoiled natural beauty. Guests have their own private lawn and garden set on a terraced hillside. Sunloungers and BBQ provided. Near many charming towns and golden sand beaches. For those who enjoy walking, cycling or having a dip in beautiful freshwater rock pools, the Serra de Arga National Park is just minutes away. Two mountain bikes are available for guests to use free of charge and guests also have access to the owner's small 'swimming pool'. The village of Covas is situated on the River Coura and has four restaurants and two shops. The village is a twenty-five minute walk through scenic roads. With double-glazed windows Treetop Cottage is a cozy and relaxing get-away. I first arrived in Portugal on a mountain bike in 1986 and immediately fell in love with the country and the people. The scenery, especially in the Minho, is so rustic and romantic, with its grape vines on tall granite posts, stone walls and houses. So I stayed in the Minho for 5 years running a campsite. In 1993 I bought a property in Covas and spent the next 6 years restoring the house. The latest labour of love has been to restore the very old stone cottage on the other side of the property into guest accommodation. I live here all year round, teaching English in the nearby town of Viana do Castelo. We bought the place in Covas because it had all the characteristics that I love about North Portugal. It had the grape vines, the fruit trees, the stone walls and terraced landscape. It is situated on one of the higher parts of the village and enjoys beautiful views. It feels remote and private, yet it is just 2km from the centre of the village. Covas itself is only a 20-30 minute drive from some of the loveliest towns of Portugal. In the Minho you really have everything: rivers, mountains, beaches, historic towns and Galicia, Spain just across the river. Now that Treetop cottage has been restored and modernised, it is, we believe, a unique accommodation. It is not overlooked by any neighbours, but overlooks a 'hidden valley' with a stream and water mills below. The cottage itself cannot be seen from the road and so feels very secluded. While the veranda enjoys sunshine for most of the day, there is shade from the oak trees nearby. We have put in large picture windows and glass patio doors so that guests can feel and see the nature all around them. Yet just a 5 minute drive or a 25 minute walk brings you to the local restaurants and shops. Bathroom with toilet, sink and shower, just beside the bedroom. Lounge with 3 comfortable chairs, DVD player with selection of DVDs, hi-fi unit, satellite TV with Sky news and CNN, card table with board games.Large picture windows and sliding patio doors with lovely views; dining room and kitchen part of 1 large room. Brand new modern kitchen, electric hob and oven, microwave oven, fridge/freezer, toaster, electric kettle, cafetiere, spice rack with herbs and spices. Beautiful terraced hillside starting with a fish pond, sloping down to a private lawn with picnic table. Spacious veranda with table and chairs overlooking the lawn and the treetops, gets sun most of the day, but shade is always available nearby. 2 lightweight, 18-speed with click gears available for guests free of charge. There is an 18-hole golf course in the nearby town of Ponte de Lima, a 30 minute drive. The 'pool with the view' is a 3m x 5m converted water tank, overlooking the entire valley of Covas, ideal for cooling off. Large sunlounging area with sunloungers, table, brolly and a solar shower. Notes on accommodation: Double glazed windows and thick stone walls keep the cottage a very pleasant temperature. Sunny veranda, but shade available all around under the oak trees. Internet reception is now available inside the cottage and all your garden area. Outside: Guests of Treetop cottage look on to and have exclusive use of a large front garden and an entire wooded terraced hillside. They overlook a wooded valley which leads to a stream and a few disused watermills. The property has a large top field where guests will park their car. A garden path and steps, illuminated at night, lead down to the cottage. The whole area is completely private. On the other side of the property, some distance behind the cottage is the owner's house. Both properties are able to enjoy their privacy. A short distance from the cottage, on a sunny terrace is a water tank which has been converted into a small swimming pool (3 metres by 5 metres), big enough for several lie-los and wonderful for cooling off. The pool has unobstructed views over the village below and to the mountains beyond. There is a large sundeck with sun loungers provided plus a table and chair with brolly. Pool is illuminated at night. Utility Room: There is no utility room, but owner can do laundry for 4 euros a load. Cleaning / Towels / Linen / Maid service: Linen and towels are provided, this does not include beach towels. Fresh towels are are provided once a week. Other: Spacious sunny veranda with table and chairs and deck chairs. Below the veranda another small patio area, sheltered from sun or rain, with barbecue. Internet wi-fi available in the cottage and reaches the veranda and garden area. This lovely property is in a beautiful setting among mature trees ideal for relaxing in the shade on very hot days and on the patio for the sun worshippers. Everything was as described if not better and our host, Ellen, could not have been more helpful. A wonderful getaway from a busy life but within easy reach of so many delightful places of interest. Ellen has friendly animals who really made Tree Tops a home from home. We could not fault it and would love to return in the not too distant future. Wonderful. The property is in a beautiful peaceful location in super unspoilt countryside. Internally it is well equipped with everything a couple need and externally there is plenty of areas to sit and relax. Wonderful walks locally and the excellent beaches are 40mins away. Ellen and her dog Rafa are good hosts and you are made to feel very welcome - thoroughly recommend it. Ellen’s treetop cottage is the perfect place for a relaxing getaway. Nestled amongst the hillside overlooking Covas, we found it to be wonderfully peaceful and the perfect escape from city life. It had everything we needed for our stay and really did feel like a home-from-home. With plenty of beautiful towns and villages, just a short drive away, we were never bored once during our stay! Whilst we weren’t blessed with perfect weather, we did manage to squeeze in a visit to a local beach and it was certainly worth the trip after we were met my golden sands overlooking the ocean. We couldn’t fault Ellen as a host, her green guest book came almost everywhere with us and we took it upon ourselves to tick off as many things as we could during our week-long stay. Plus we couldn’t go without mentioning Ellen’s gorgeous and friendly dog, Rafa, who greeted us on the terrace each day with a wagging tail. I would highly recommend this lovely accommodation to anyone wishing to visit northern Portugal and all the delights it has to offer. We really enjoyed staying at Treetops. 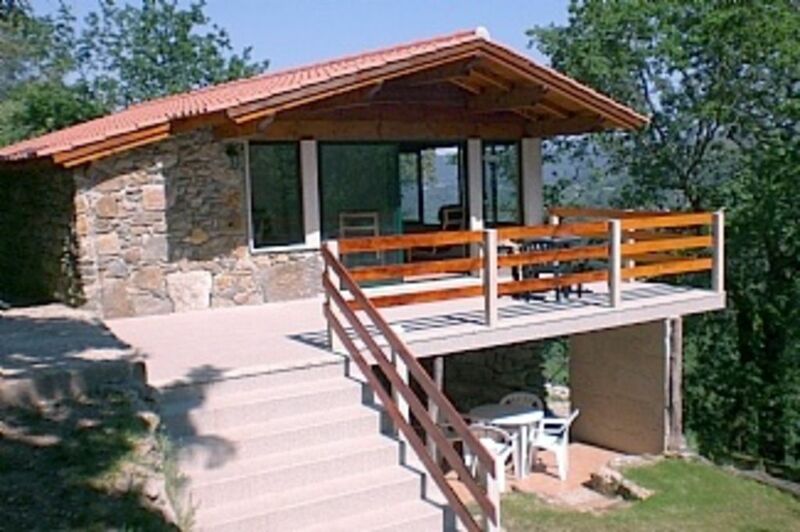 The location is great for exploring northern Portugal and the cottage is well equipped and furnished. Dank U wel! Tot fogende keer! Surfing lessons or surf board rental available at nearby beach of Moledo, a 30 minute drive. A 25 minute drive brings you to the first of the Atlantic beaches at Caminha, also on the mouth of the River Minho. From there south to Viana do Castelo there are 4 or 5 beaches to choose from with pristine white sand. Vila Praia da Ancora is also a fishing village with a charming port. The closest international airport is Oporto, served by Ryan Air and Easy Jet. It is an hour and a quarter minutes drive to Covas; hire car is recommended but not essential, if you are happy to stay in Covas and walk. Covas can be reached by train from Porto to Vila Nova de Cerveira, then a taxi. There are many hire car companies available at Oporto airport. It is advisable to book your hire car at the same time as your flights, because prices go up dramatically if you leave it late. Covas is a very picturesque village, where the locals still look after their grape vines and cultivate their fields. Many of the roads are cobbled and the boundary walls are often in stone. The village is on a river valley, but surrounded by beautiful mountains. It makes for pleasant leisurely walking; along the way you can find one of the 4 bar/restaurants to have a drink or try the local food. Eating and drinking is still very inexpensive here. All 4 restaurants offer a daily plate during the week which includes soup, a generous serving of the main course, and your drink for 6 euros. One place specializes in delicious barbecued chicken and mixed grills. There are also two shops where you can find almost everything you need, from fresh bread to fruit and vegetables. So on days when you don't feel like driving far, you can find all you need in Covas. It also has a cash point and a post office. Markets are a big feature of life in the Minho. Vila Nova de Cerveira has an excellent market on Saturdays, Caminha and Valenca on Wednesdays, Viana do Castelo on Fridays. The nearest large supermarket is just 20 minutes away in Vila Nova de Cerveira. I would like to welcome guests from many different countries. I speak German, Dutch, French, Spanish and Italian. Viana do Castelo, Ponte de Lima, Caminha, Vila Nova de Cerveira, and Serra d'Arga (the National Park), all within 30 minutes driving from Covas. Booking Notes: Bookings can be made by phone or email. 25% non-refundable deposit required at time of booking, the balance to be paid 4 weeks before arrival. Preferred method of payment is bank transfer or PayPal. Please make sure you are fully insured against injury, sickness, cancellation, losses, etc, as we cannot accept liability for any loss or damage to your personal property or for any illness that may develop during your stay with us. Changeover Day: any day of the week Changeover day can be flexible (minimum stay 5 days), but we would ask guests to vacate the cottage by 10.00 and to arrive after 2pm, to allow time for cleaning. If new guests are not arriving on the same day, departure time can be flexible. Notes on prices: Prices are for the property per week in euros for 2 people.